Apple's AirPods are proving pretty difficult to get hold of right now, but thankfully they are not the only truly wireless earbuds out there. That might come as a surprise to lovers of all things Apple and, yes, for those who don't want to stick those toothbrush head-looking Pods into your ears, you do have other options. Those options are also smarter, too, and while still veering on the pricey side, you do get more features for your money. And they'll still do those all important things, like letting you listen to music wire-free or take calls hands-free. We've tested a bunch of other smart earbuds and picked out our favourites that you might consider trying out instead of Apple's ones. Whether it's a better fit, fitness tracking, or augmenting audio, there's should be something for everyone here. Our top pick to go for if you don't want Apple's smart buds comes from its biggest rival, Samsung. While last year's Gear IconX were pretty underwhelming, the 2018 edition step things up in a big way, with improved battery life of five hours (or seven hours in standalone use) and support for smart assistant Bixby. While its lost some of its fitness tracking prowess with the omission of the heart rate sensor, there is now new audio coaching for keen runners. It does, of course, work with iPhones, and even if you have a non-Samsung Android smartphone in your pocket, the buds will tap into Google Assistant. We're big fans of the new Gear IconX, and while they are little more expensive than Apple's Pods, they're a fitting replacement. Re-upping its original hearable solution, Bragi has brought a Pro edge to its Dash buds. And this isn't just a lick of paint — it bumps up battery life to five hours, debuts real-time translation, tracks exercise automatically and even offers a 4D menu that allows you to use head gestures to navigate menus. If you want to really jump to the next level, you can also get the Dash Pro, tailored by Starkey, which will see you head to an audiologist and get a custom fit — perfect for those who have a hard time finding a solution for their ears. Its fitness smarts, which include heart rate monitoring and swim tracking, may not have been completely faultless during our testing, but this is still an impressive and deeply impressive pair of buds. With Doppler Labs closing its doors, there's an alternative ready to take its place. If you're craving optimal wireless sound, the Nuheara IQ is a good fit. The crowdfunding success story raised ten times its initial target before shipping in January 2017. And much like the Here One earbuds, the IQ focuses on altering how you hear the world around you. Also involved is noise cancelling and the ability to mix your own balance between your music and the surrounding world. During our experience, we enjoyed the sound options, audio blending and range of presets, plus the new custom tap-touch improves controls from the bud. Battery life is solid, too, making it a great AirPod alternative. 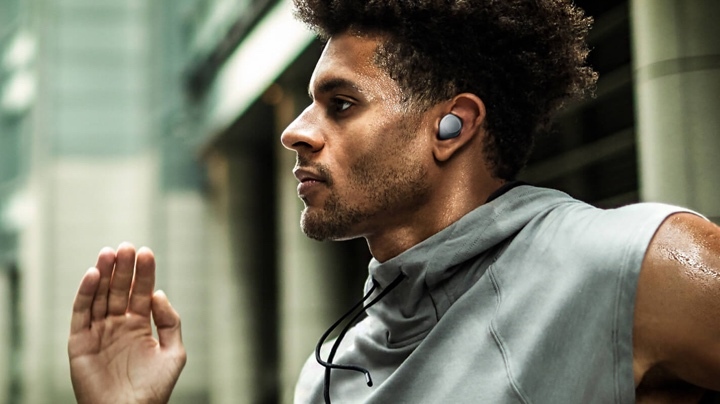 Audio quality and fit are important, but the Jabra Elite Sport are on hand for those looking to take a pair of wireless earbuds out with them during exercise. On the tin, you've got it all here - real-time coaching, heart rate tracking and VO2 Max testing, plus sweat and waterproofing. However, there's also audio pass-through in order to let you pay attention to the world around you and switch between calls and music. In testing, it's worth noting we found that the sports tracking, comfort and sound quality to be solid, though HR tracking had its inconsistent moments and hammers home that you need to get the right fit. Thankfully, Jabra has offered plenty of support post-launch to greatly improve one of our other gripes, battery life, and also added the ability to tune your sound with new equaliser profiles.